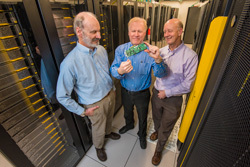 Lewis Rhodes Labs in partnership with Sandia has developed a sophisticated cybersecurity system to detect general indicators of an attack nearly 100 times faster. Cybersecurity systems normally name such attacks as ‘bad apples’ – and very specific patterns as ‘bad Granny Smith apples’ or ‘bad Red Delicious apples.’ The more sophisticated ones excel at finding bad apples in computer networks, but lack the computing power to identify the threats directly. And this is where Lewis Rhodes Labs/Sandia’s Neuromorphic Cyber Microscope comes into play: Due to its brain-inspired design, it can look for the complex patterns that indicate specific bad apples, all while using less electricity than a standard 60-watt light bulb. The processor in the Neuromorphic Cyber Microscope is the brainchild of pediatric neurologist and neuroscientist Dr. Pamela Follett, and her husband David Follett, co-founder and CEO of Lewis Rhodes Labs. Comparing brains with cerebral palsy to healthy brains was key to the deeper insights: A team led by Sandia computer systems expert John Naegle sought problems where the neuromorphic processor would excel. The team looked at robotics and pattern recognition before settling on cybersecurity. Both the Neuromorphic Cyber Microscope and the human brain continually scan for threats. A hose or stick can cause you to jump, even if you’re not searching for a snake. Similarly, the Neuromorphic Cyber Microscope compares streaming data to suspicious patterns in a time-dependent manner. In contrast, conventional cyberdetection systems sequentially match small chunks of data against a library of ‘bad apple’ patterns, which is less efficient, opines Naegle. Sandia tested the Neuromorphic Cyber Microscope on its cybertraffic in a demonstration environment. As the ‘bad apple’ patterns got more complex, the state-of-the-art conventional system slowed exponentially, but the Neuromorphic Cyber Microscope kept performing efficiently, said Roger Suppona, a cybersecurity expert at Sandia. In fact, it’s more than 100 times faster and 1,000 times more energy-efficient than racks of conventional cybersecurity systems. “This completely changes the way that we look for suspicious activity without running the risk of overwhelming our analysts with too much information,” said Suppona.